So I guess I broke all of the workout rules, but I spent Saturday watching the Food Network while walking a few miles on the treadmill at my gym. To be honest, I was glad that the gym wasn’t crowded as I kept cutting my eyes over to the person two machines over, hoping she couldn’t see what I was watching, totally grateful my face was flushed from walking and the casual observer couldn’t tell that I was a little embarrassed. What does that say about my commitment to the workout? Hmm… it’s probably best not to think about it too much. The Neelys were making Swiss Chard Soup, which put me in the mood for collards. As a Southerner, I have a deep affinity for collard greens. 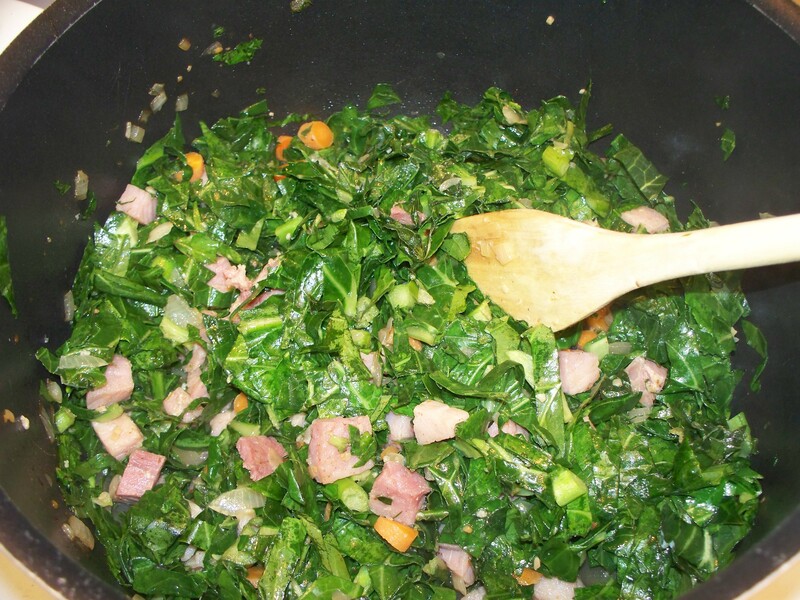 My grandmother, Frances Cribb, would cook and “put up” collards in the freezer so that we could enjoy them year-round. And while today you can get collards pretty much all of the time at the local grocery store, there are those who believe collards are best “in season,” myself included. Collard season is in the colder months after the first frost – we’re at the tail end of cool weather in South Carolina, and I figured this was my last shot for collards for a while. Collards are part of the cabbage and broccoli family and are full of vitamin C and fiber, and also contain nutrients with strong anti-cancer properties. And to top it off they are very low in calories with about a quarter cup of cooked collards containing less than 50 calories. I had recently eatten a good collard soup at Cantina 76, a Mexican restaurant in Columbia, South Carolina and I had wanted to make one. I used the Neely’s as a basis. To see their complete recipe click here. Below are the adjustments I made when making Collard Soup. Add the bacon to a heavy-bottomed Dutch oven over medium heat. Fry until crisp, then transfer to a paper towel-lined plate and reserve. To the same Dutch oven, add the onion, garlic, and carrot, and saute until the vegetables are tender, roughly 4 minutes. Add the ham steak (and the bone if you’ve got it – it adds great taste!) and red pepper flakes and adjust the seasonings with salt and black pepper, to taste. Add the collards and saute until it begins to wilt. Stir in the chicken broth, black-eyed peas, and the canned fire-roasted tomatoes with their juices. Bring the soup to a boil, then reduce the heat to a simmer and let cook for 45 minutes. Taste for seasoning and add more salt and pepper, if necessary. Ladle the soup into serving bowls and sprinkle each serving with bacon. This is a great soup to share! I gave some to my neighbor and my parents and they all raved over it. On the Shelf Out Tasting What's Simmering?